Steel reinforcement bars are widely used in building construction these days. They impart tensile strength to concrete and acts as one unit when load is imposed on it. Steel bars used are mainly TMT bars. TMT bars are deformed bars, with rough surface. Due to deformations on the surface (i.e. rough surface) concrete bonds very well with the bars and reduces the slippage. Modulus of Elasticity: Steel has high modulus of Elasticity i.e. 200GPa (200 x 10⁹ N/m²). This helps the steel to stretch in tension(upto 200GPa) without breaking and regain its shape on removal of load. Ductility of Steel: Ductility of steel is high. i.e. 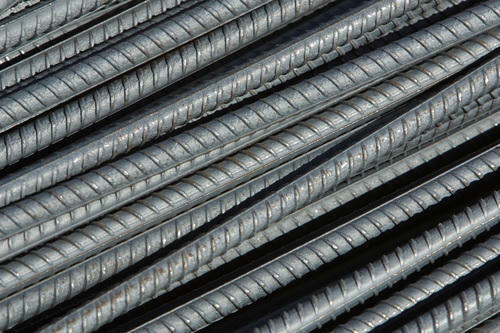 Steel rebar will behave ductile under higher loads. Ductility is the ability of material to allow plastic deformations (i.e. permanent change in its dimensions) under application of load before breaking. Coefficient of Thermal Expansion: Steel and concrete has almost same coefficient of thermal expansion (change in dimension due to temperatures). Due to this both (concrete and steel) will experience same length changes in high temperatures. Resistance: Steel is resistant to rough conditions during transport, storage, bundling and placing on construction site. If minor damage happens, it does not significantly affect its performance. Strength: It is strong enough to withstand high impact load. Readily Available: Structural Steel industry has enough production capacity to meet the demands of construction industry and is available at ease for any house construction. Ready Build: These days ready build steel is also available. Ready build steel eliminate the time of cutting and bending. This saves lots of construction time as well as minimizes the wastage of steel in bending and cutting. Steel can be recycled easily. High Cost: Steel is expensive and considerably increases the cost of structure. High Temperatures: Steel show tendency to melt in extremely high temperatures. This is also one of the reasons; steel is tied and not welded. Reaction: Too little concrete cover allows the water to penetrate and react with steel rebars causing concrete to crack. Occasionally concrete aggregates react with steel causing concrete to spall. Rust: Steel exposed to weather rusts and reduces the strength of reinforced concrete. When rusts start building up around the steel rebars, it causes severe internal pressure on the surrounding concrete, leading to cracks in concrete. Weight: It is not a light weight material.